Gunner when he arrived at the OHS. Meow! 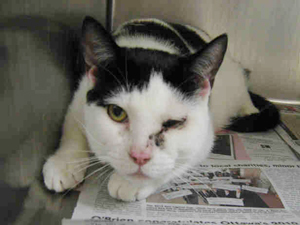 My name is Gunner (A114700) and I am a four-year-old black and white shorthaired domestic cat. I had a painful injury to my left eye when I was found by a concerned member of the public who brought me to the Ottawa Humane Society (OHS). The OHS veterinary team found that I was suffering from an entropion of the eyelid, meaning my lower eyelid was turning directly towards the surface of the eye, causing me discomfort. The rubbing can result in tearing, crusting of the eyelid, discharge, irritation of the cornea and impaired vision. I was given medication to control my pain, and the veterinarian explained to me that I would have to undergo surgery to eliminate the risk of corneal scarring, infection or loss of vision. Unfortunately, while I was recovering from my surgery, I contracted an upper respiratory infection (URI), which is a bad cat cold. I was given more medication and lots of attention to make sure I was recovering properly. After nearly two months of being treated by the staff at the OHS, I was finally ready to look for my forever home. 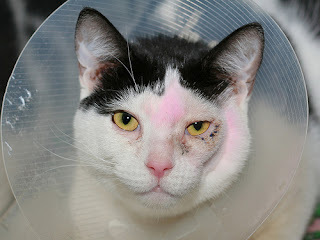 Please help Gunner, and other animals like him in need of emergency animal treatment, by making a donation.